Consumers cite safety features as one of the most important considerations they make when choosing a car. We hope you never need them, but when the unpredictable occurs, you want to make sure you and your loved ones will be protected in the case of an accident. Check your dashboard indicators. If your SRS light is on, your airbags may not deploy in an accident. Similarly, if your ABS light is on, the anti-locking features may not kick in when you need them the most. These are serious and potentially dangerous situations. Do not delay in bringing your car in for a check. 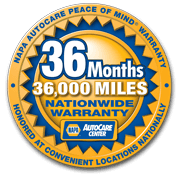 Let our ASE-Certified Technicians give you peace of mind in knowing these systems are functioning properly, enabling you to retain control of your vehicle when that deer darts out in front of you, the snow hits or that wayward driver cuts you off in traffic.